Our library of proprietary resources includes 25+ quick-take assessments, idea-generating templates, and team activities – on trust and communication and engagement and self-leadership and much more. Select tools are put to work in our Next Level Workshops — and some organizations purchase a license agreement so managers can have ongoing, anytime access to the entire library. Click on any cover below to learn more. This quick-take assessment is all about action. It gives insights into what you’re currently doing to build trust – and what you can start doing to make more progress. 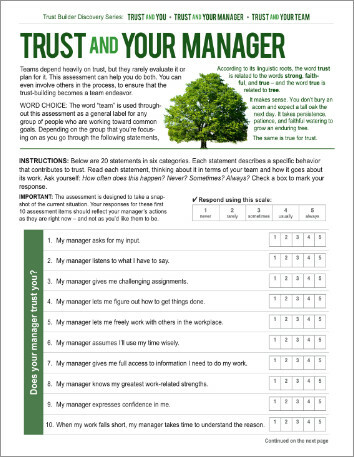 Trust is crucial in a person’s relationship with their immediate manager. 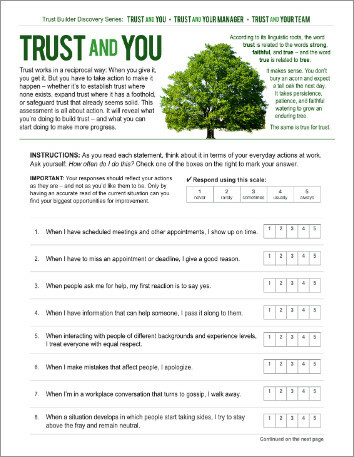 This assessment reveals where trust is strong and where it has the most room for improvement. 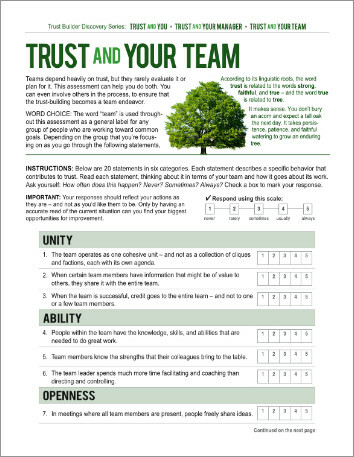 Teams depend heavily on trust, but they rarely evaluate it or plan for it. This assessment does both. It looks at trust from six angles: unity, ability, openness, integrity, support, and improvement. People in teams do a lot of talking, but they don’t always communicate. That’s why this assessment is so important. 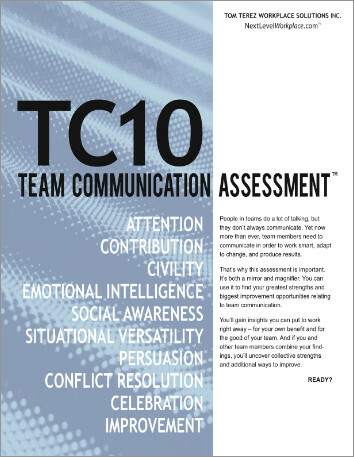 It reveals a team's greatest strengths and biggest improvement opportunities relating to team communication. In these times of challenge and change, we all need to work smarter. This quick assessment uncovers how. It goes in-depth in four areas: improvement, learning, productivity, and perspective. What makes work more than just work for a person? This assessment finds out. It looks at 10 major sources of engagement: purpose, interest, fit, challenge, mastery, creativity, self-direction, collaboration, impact, and enjoyment. 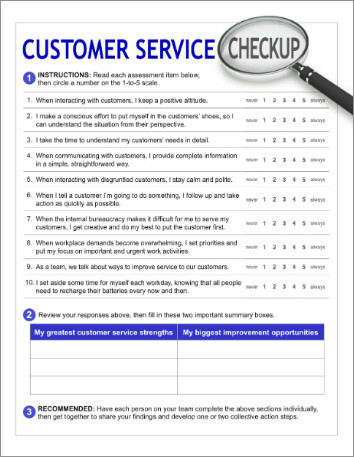 There's no substitute for pausing periodically to review how well we're serving our customers. 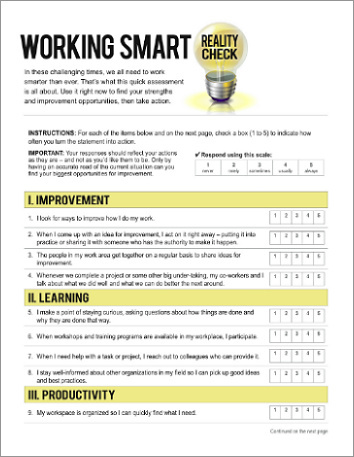 This 10-item self-assessment covers everything from communication to initiative to prioritization and much more. Some people seem wired to see the glass half full, but most of us have to work at it. 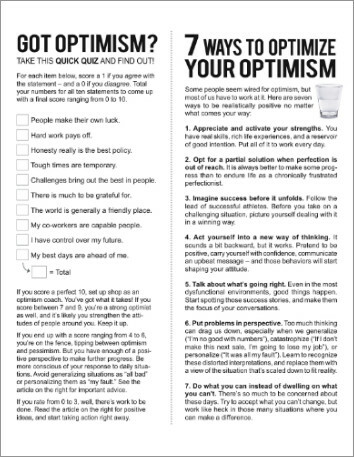 This one-pager includes a super-fast self-assessment -- and seven practical action steps for taking optimism to a higher level. These are three very important pages! 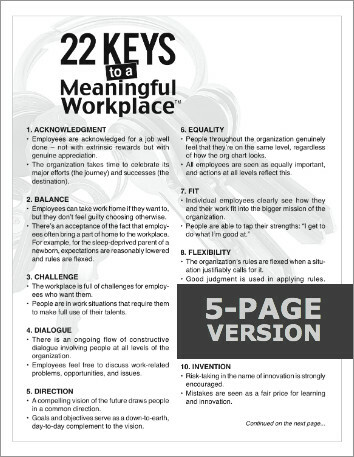 Pages 1-2 prompt people to think about all the factors that can bring out the best in people at work. Page 3 is a worksheet where they draw important conclusions, including which key is most important to them. 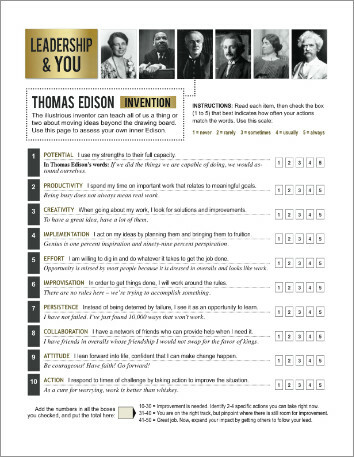 This expanded version of the 22 Keys assessment adds a page of instructions on how to use the keys in a 90-minute team activity -- plus an action-planning template that will keep groups on track as they clarify their next steps. We all have the potential, if not the obligation, to do great things. 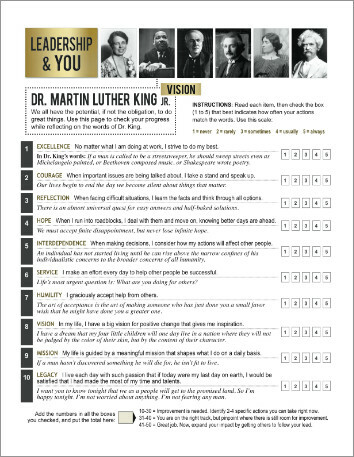 People can use this page to check their progress while reflecting on the words of Dr. King. 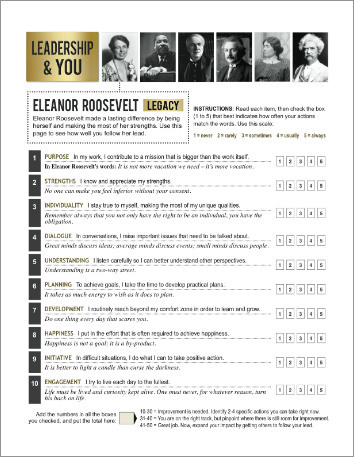 Eleanor Roosevelt made a lasting difference by being herself and making the most of her strengths. The prompts on this page will show people how well they're following her lead. 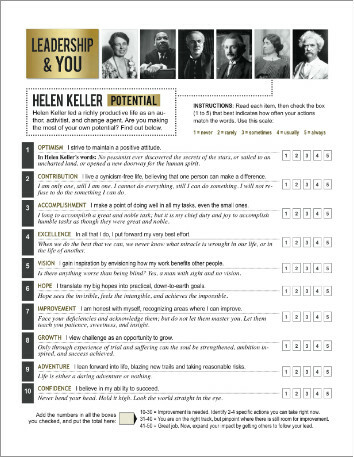 Helen Keller led a richly productive life as an author, activist, and change agent. She left a legacy that should get us all asking: Are we making the most of our own potential? Intelligence takes many forms: cognitive, creative, social, emotional, and more. 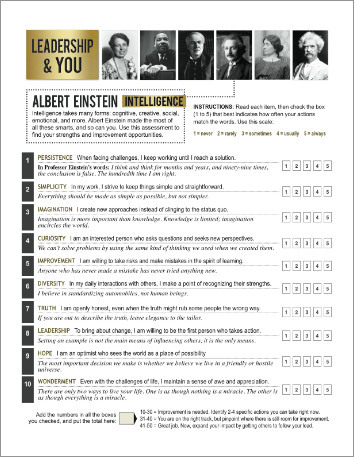 Albert Einstein made the most of all these smarts -- and this assessment can reveal whether we're doing the same. The Wizard of Menlo Park can teach all of us a thing or two about moving ideas beyond the drawing board. This assessment shines a light on everything from productivity and creativity to collaboration and implementation. 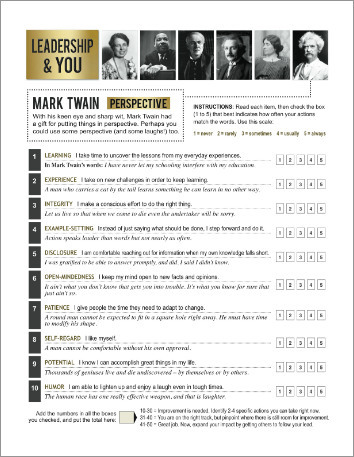 With his keen eye and sharp wit, Mark Twain had a gift for putting things in perspective. This assessment is perfect for anyone who could use some perspective (and some laughs!) too. 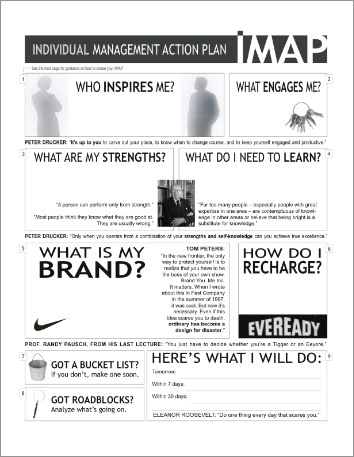 IMAP gives insights that individuals can use to become better leaders and managers – of themselves. 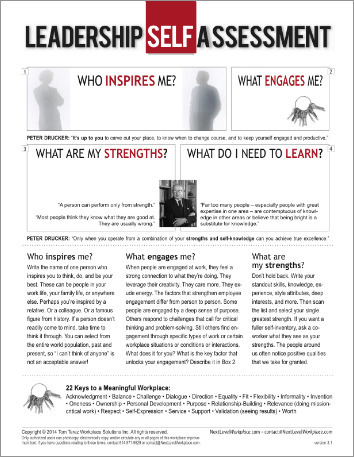 It looks at strengths, at sources of inspiration and engagement, at opportunities to learn and recharge, and more. Page 2 provides detailed guidance. 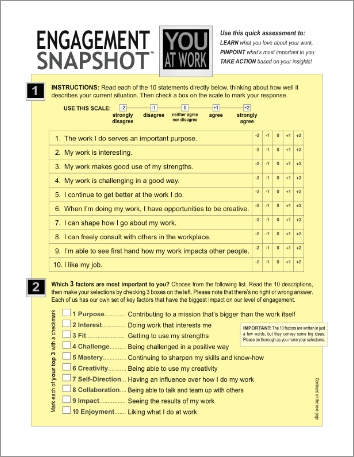 This short version of IMAP (Individual Management Action Plan) prompts discovery in four key areas of self-leadership: inspiration, engagement, strengths, and learning. It's perfect for setting the stage for meaningful dialogue among team members. This series consists of 22 separate one-page assessments. Each includes five prompts designed to expand understanding and assess the current situation. Colleagues can then compare notes and turn their discoveries into action steps. 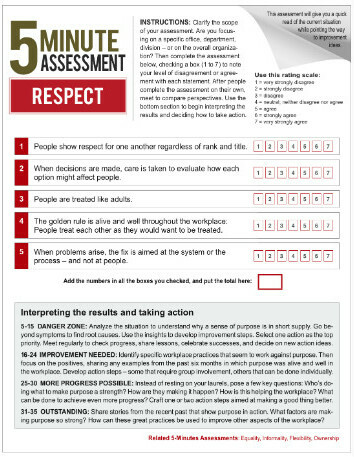 Assessment topics: Purpose, Direction, Relevance, Results, Respect, Equality, Informality, Flexibility, Ownership, Challenge, Invention, Support, Personal Development, Dialogue, Relationships, Service, Acknowledgment, Oneness, Self-Expression, Fit, Balance, Worth.